Efficient on-the-job performance, quality installations, and happy building owners. Get your team up to speed fast. Salespeople submit competitive bids and close deals. Designers select and configure the right equipment easily and accurately, with full understanding of the features and options available. Installers learn proper procedures, techniques, and skills to complete jobs safely and with accuracy, all while helping projects stay on-time and on-budget. 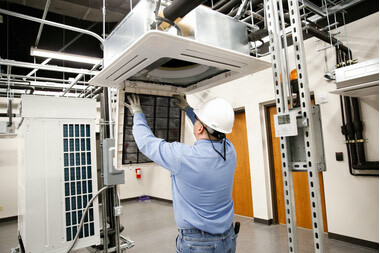 Service technicians learn how to properly troubleshoot and diagnose VRF systems. Gen I & II VRF Installation Only: Required to qualify your company to properly install JCI VRF products and accessories. This course is designed for Sales professionals, architects, consulting engineers, mechanical contractors, and other professionals involved in the design, selection and/or installation of Hitachi SmartFlex VRF systems. While some professionals may not be required to attend this course, the knowledge obtained provides a valuable understanding of the installation requirements and knowledge of overall system operation. Gen II & II VRF Commissioning Only: Required for mechanical contractors that wants to commission and properly service JCI VRF equipment. This course is designed for mechanical contractors, project managers, controls technicians, service technicians, and commissioning agents who want to learn how to effectively commission Hitachi SmartFlex™ VRF systems while using the advanced VRF Service tool to record operational data which is a commissioning requirement as well as using it as a diagnostic tool for troubleshooting VRF Systems. Completing this course also qualifies the equipment for an extended warranty. VRF contractors are required to have at least one individual from their company attend the installation and commissioning training program, and maintain the certification with renewals. Mini VRF Installation and Commissioning: This course is designed for Mechanical contractors, installation personnel, building maintenance personnel, project managers, and control technicians who want to learn how to properly install and commission Hitachi SmartFlex™ Mini VRF systems. The attendee will learn to configure local controllers, make all unit settings, along with correct piping installation using best practices teaching techniques. Duct Free Mini Split Installation & Startup: Often referred to as “Mini split”, “DFS”, or “Ductless”, this course is designed for Mechanical contractors, installation personnel, building maintenance personnel, and project managers who want to learn proper procedures to install, startup, and test SmartFlex™ Mini split Systems in this instructor led class that includes hands-on experiences. The attendee will learn to configure local controllers, make all unit settings, along with correct piping installation using best practices. VRF Controls Commissioning: A must for the controls side of the business who wants to control Hitachi SmartFlex™ VRF systems in the most efficient way possible. 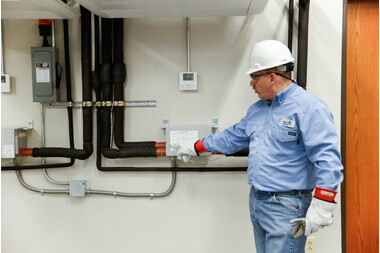 Designed for Mechanical contractors, installation mechanics, building maintenance personnel, project managers who want to learn the proper procedures and techniques for installing and commissioning the VRF Controls systems in this instructor-led class that includes extensive hands-on experience with fully functional VRF lab equipment. 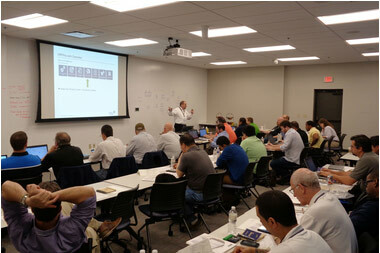 The VRF training center features a dedicated VRF laboratory where attendees gain hands-on experience with the various systems, components and controls. Videos and webinars supplement classroom learning on specific subjects and refresh and enhance the skills of your sales, design, installation, and service teams. Hitachi SmartFlex™ VRF training programs help deliver peace of mind that your staff members are prepared with the knowledge and skills they need to support your business for a multitude of project types. To learn more about training and course offerings click these links!